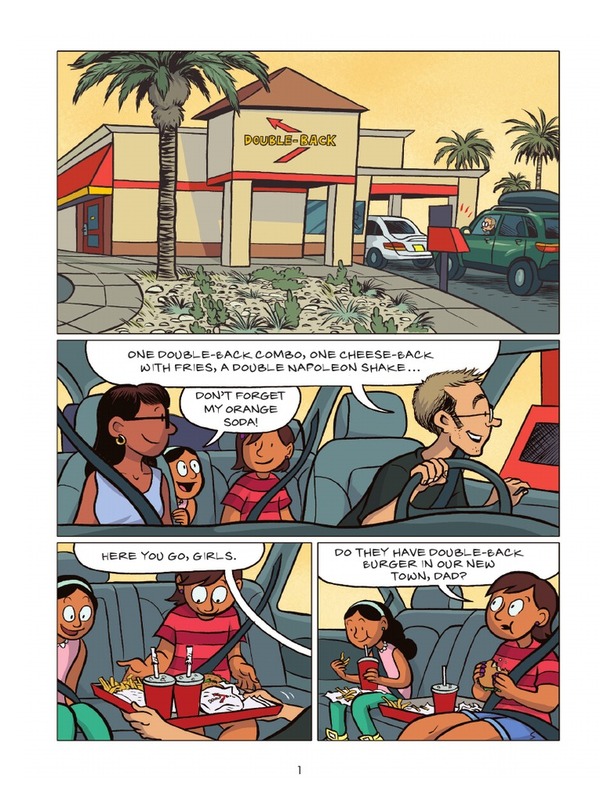 In 2010, Raina Telgemeier was my introduction to graphic novels. As a bookseller, I was aware of the section with graphic novels for adults and, for the most part they seemed like bleak, dark stories filled with superheroes. Upon seeing Telgemeier's book on the shelf in the kid's section, I was drawn to the mint green cover with the bright yellow, braces filled smiley face of Smile. While I was a bit suspicious, thinking this might be a more superficial story about the awkwardness of braces, I was hooked immediately when I read the first few pages, learning real, autobiographical story behind the braces. Since that day, I have eagerly awaited, read and reviewed all of Telgemeier's books (except Sisters, for some reason) and you can read those reviews here. When I became an elementary school librarian two years ago, one of my first missions was to create a graphic novel section. The shelves currently hold (when they are not checked out, which they always are) ten copies of Smile and Sisters, three copies of Drama and four sets of the four The Babysitter's Club graphic novels, including one set in the newly colored editions. And, once I get my book budget for the year, there will be five library bound copies of Ghosts sitting beside the three paperback copies I bought out of pocket. 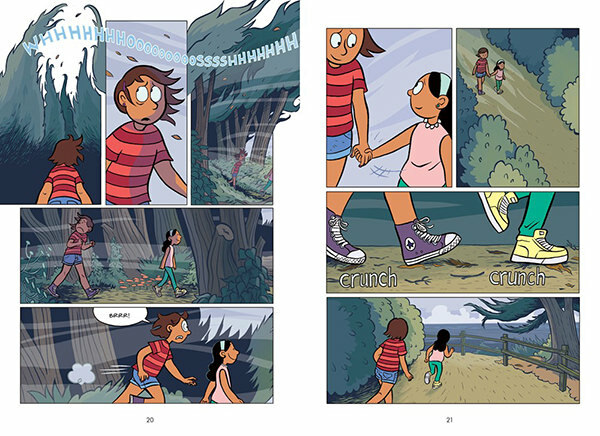 Raina Telgemeier has a gift for creating immediately accessible characters who are as colorful and full of life as her vivid illustrations. She also is exceptionally talented at presenting families that, while they have their struggles and conflicts, are connected, supportive, loving and thoughtful. With Ghosts, Telgemeier adds a new layer to her storytelling in the character of Maya, younger sister of main Catrina, who suffers from the degenerative condition, cystic fibrosis. Maya's illness is what causes the family to move from Southern California to the small seaside town in Northern California, Bahía de la Luna. As a native Californian, I love that Telgemeier sets some of her stories here and was so excited to learn that the town of Half Moon Bay was the inspiration for the setting of Ghosts. I also got a kick out of her version of In & Out Burger, a chain restaurant that is only in Southern California. 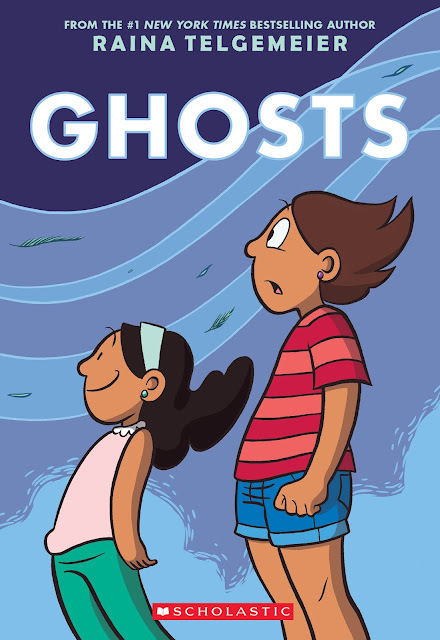 Telgemeier introduces and balances many themes skillfully in Ghosts. There are sibling issues, like Maya's illness and how Cat lovingly protects her but also wants a life of her own, separate from Maya. Then there are family issues that arise as they settle into Bahía de la Luna, which has a large Mexican American population. When the girls learn about Día de los Muertos, the Day of the Dead, which is celebrated with a huge festival and midnight party in Bahía de la Luna, Maya questions her mother about her childhood as a second generation Mexican American. And, with Ghosts, Telgemeier introduces magical realism into her story telling. Carlos Calaveras, neighbor and classmate of Cat's, works as a guide, giving tours of the ghosts of Bahía de la Luna. Cat is suspicious, then furious after she sees that Maya is enthralled with the idea of ghosts and take chances with her health to see one. Cat tries to humor Maya and her excitement over meeting a ghost, but their expedition ultimately puts her in the hospital. Cat spends the rest of the novel coping with her guilt, making new friends, being angry at Carlos and worrying about Maya. 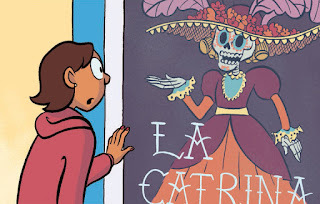 Telgemeier ends Ghosts with the marvelous Halloween night, which flows into to the Día de los Muertos celebration where Cat has a change of heart that allows her to make connections with the abuela she never knew, forgive Carlos and make Maya's wish come true. This is a fantastic trailer that captures the magic of Ghosts!